I use microwave popcorn. Never said I wasn’t trashy. The quantities below (the molasses contribution comes from the new Baked book – it makes for a smokier flavour than other versions I’ve tried but I also tried Orangette‘s recipe and really liked it) are enough to cover two bags of popcorn but I think using even more popcorn would be better as it’s quite dense, sticky stuff when you pour it over. Half-coated pieces of this recipe would probably work just as well, or better. Make sure you have the ingredients weighed out, the unpopped kernels discarded, and a sugar thermometer ready before you even think of showing the butter to the pan. The baking powder causes the mixture to fizz magnificently so make sure it’s a big enough saucepan to accommodate. Pop the corn, preheat the oven to the lowest temp, 130C/250G/Gas Mark 1. Lay the popcorn out in a non stick roasting pan. Pour over the popcorn, stir around for coverage. Scatter the chopped nuts – and maybe some sea salt – and put in the oven. Bake for 35 mins, removing it halfway through to stir and redistribute the caramel. I’d like to try this with more vanilla/omitting the nuts and using orange essence instead of vanilla/with caramel and cracked pepper. I see a lot more of this in my future…and don’t be tempted to omit the oven stage. The slow melt allows you to get much better coverage – and should you have the restraint of a jockey making weight, it keeps well in an airtight tin. Apparently. 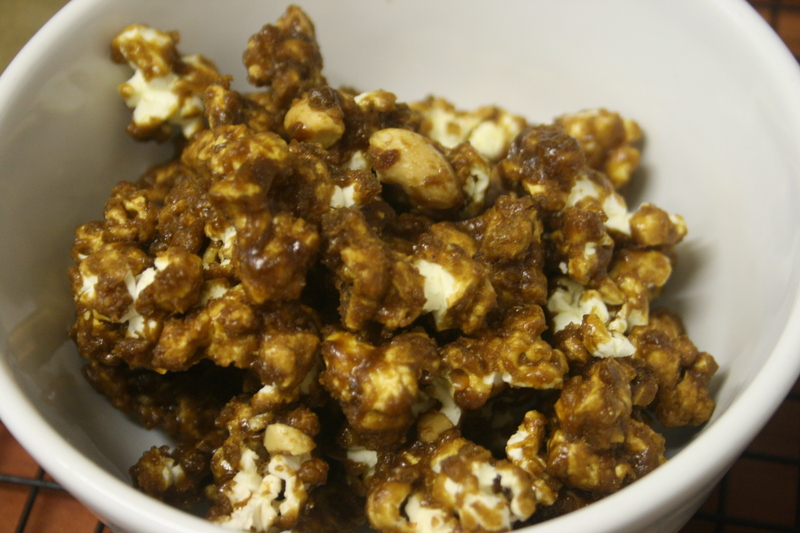 I am a caramel corn addict! Back home we used to queue for Garrett’s in Chicago. I also think you have just convinced me that I need to try this recipe with bacon. Caramel is just about my favourite thing… And then of course there’s our theory that there’s no dish that can’t be improved by the addition of chocolate, cheese or bacon. Nom! I have a raging addiction to salt caramel. Sadly also back on the diet wagon after falling off rather dramatically, so this will have to wait. Interesting to know where you have sourced corn syrup in the UK too.